Eibach vs. Bilstein Shocks: What are the Best OEM Replacement Shocks? Discover what replacement struts are best, Eibach or Bilstein. When choosing your new shocks, you have a big decision to make. Eibach vs. Bilstein shocks—which one shall it be? While either one is an excellent choice, there are definitely things to take into consideration when making your buying decision. First, you’ll want to consider your vehicle and what your specific suspension needs are. With the slogan “The Will to Win,” Eibach is driven to build some of the world’s best springs, coil-overs, dampers, anti-roll bars and other suspension components. 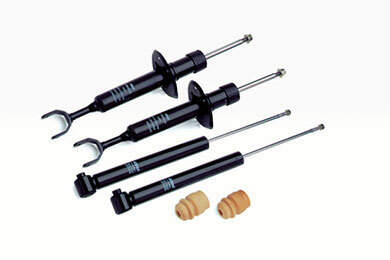 Take, for example, the Eibach Springs Pro Damper Shock Absorbers. These shocks offer the ultimate in shock absorber tuning and technology for your lowered vehicle. They’re specially designed to take advantage of the lower center of gravity and increased spring rate of performance springs. On the other side of the competition, we have Bilstein shocks. 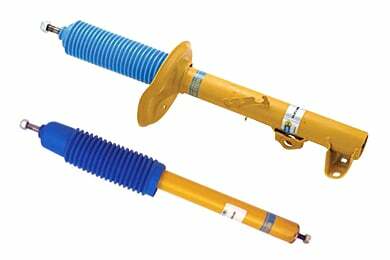 Bilstein revolutionized the shock absorber industry way back in 1954 by perfecting the mono-tube gas pressure shock. And, today they carry some of the best performing shocks in the industry, like the Bilstein Heavy Duty Shocks and Bilstein 5100 Series Shocks. Whether you’re looking for your lifted truck, daily driver or lower sports car, there’s a Bilstein shock made for you. Can’t decide between Eibach and Bilstein? Let our customers help you. We give you access to hundreds of shock absorber reviews on our website. So, you can see what other car enthusiasts have to say about the Eibach Pro Street Coil Over Springs or the Bilstein Touring Class Shocks. We offer vehicle specific reviews, so you can see which Eibach struts work best for your Honda Civic, or which Bilstein shocks you should purchase for your Ford F150. My new ride-quality is good and overall comfort wasn't compromised. There's a slight stiffness, but that's expected with lowering springs. I put these shocks on my 2003 Chevy 1500HD Crewcab 4X4, which is a heavy pickup, but I added Ranch Hand replacement bumpers and it added alot of extra weight. Man! My truck rides 100% better! It will never ride like a car, but these shocks smoothed out the harshest bumps and makes the high-speed bumps feel almost a non-issue! These are great shocks! Reference # 762-807-715 © 2000-2019 AutoAnything, Inc.